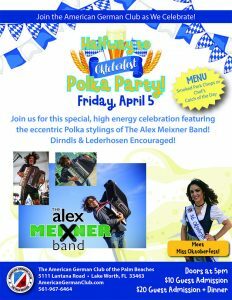 Friday is our first appearance at the American German Club of the Palm Beaches (Lantana)- for their Halfway to Oktoberfest party. It’s been 25 years since I’ve been to the club so I’m looking forward to playing for all the fun people down there! 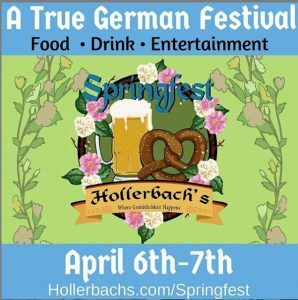 Saturday and Sunday we return to Hollerbach’s in Sanford for their Spring Fest. 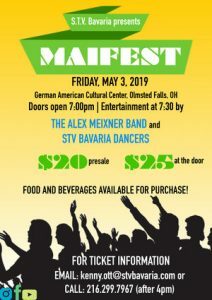 In addition to the Alex Meixner Band and the regular extraordinary Willow Tree entertainers, “Jimmy and Eckhard,” we are really looking forward to sharing the stage with Martin Gross’ Sonnenschein Express. This was a great time last year- so we’re sure it’s going to rock again! As a special treat this weekend, one of my best friends- Dr. Michael William Patrick Fortunato will be playing woodwinds for us. Those of you who have seen Fort or the Dr. with the band, know he brings a special energy to the stage. It’s definitely worth that quick Florida getaway from our friends in the north who might’ve forgotten that spring means it’s supposed to stop snowing and get warmer!! We’ll also have the new CDs and t-shirts (including the new ladies v-necks!) for sale all weekend!